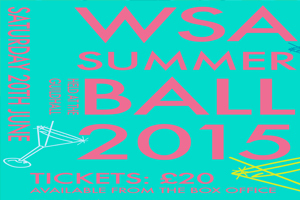 A team of dedicated students from the Winchester School of Art have pulled together and organised a Summer Ball for everyone over at WSA – a fantastic effort. Read on to find out what the night has in store. The Ball will be at the gorgeous venue of the Winchester Guildhall on Saturday 20th of June, and will provide the perfect chance to celebrate after handing in all your assignments and projects. The team have organised a stellar line-up for the night, designed to dedicate to everyone’s tastes. First to the stage will be acoustic singer-songwriter Pelle Van Smith – you can check out his sound over on YouTube here. Following him will be Winchester-based band, Home Clouds; have a listen to their SoundCloud to get a taste of what they’ll be playing on the night. Next on the line-up is Jealous Michael, a melodic rock band from Brighton – you can find out more about them on their Bandcamp page. Finally, DJ MrGrapht will be wrapping up the night with his set, followed by playing your requests until the early hours. The Guildhall will be putting on a special array of cocktails on the night, as voted by you! Cocktails available are Caribbean, Bridget Jones, Guildhall Berry Special, and the classics Woo Woo, Pina Colada and Margarita – you can find out more here, and all cocktails will be £4 each, or you can take advantage of the amazing deal and grab two for £7. Tickets for all this are only £20, and are available on the SUSU Box Office until midday on Friday 12th June. The night will kick off at the Guildhall at 8pm on the 20th – see you there!